The Ashram’s version of Shree Guru Gita is both the same and different than when Swami Nirmalananda first learned to chant it with Baba Muktananda. He arranged it with the men and women taking turns chanting the first and second lines of each verse. This allowed gathering one’s breath and focus while the other line was being chanted. Just like many of us, Swamiji learned the Guru Gita by following the pronunciation guide in the chanting book. She loved it so much that she would chant both lines, doing so quietly so she didn’t disturb those around her. The more she chanted it, the easier it became and the more she loved it. During the eleven years she lived in the Ashram, Swamiji has chanted thousands of Guru Gitas! She also played harmonium and served as the head of the music department in several ashrams and meditation centers. Playing the harmonium meant she had to sort out which notes went on which syllables, which increased her familiarity and intimacy with the Gita. After Baba’s Mahasamadhi in 1982, Swamiji came back to America to be a soccer mom, driving kids around in her station wagon. 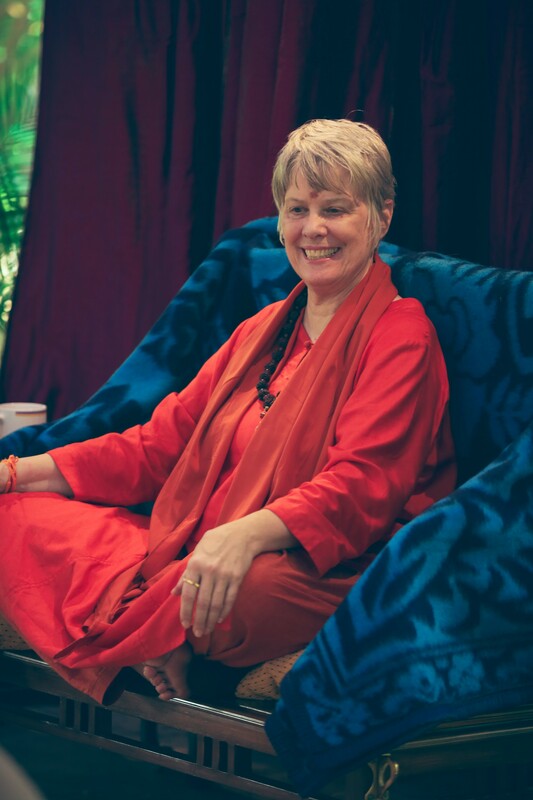 At this point, she was chanting the Guru Gita two or three times a week, and would listen to a recording of it when she wasn’t able to chant it herself. Swamiji found she could chant it faster without a recording in the background. Opening the Ashram in 2010, Swamiji realized that many would be doing the chant for the first time. To support people in learning the text and pronunciation, Swamiji chants both lines and invites everyone to decide for themselves whether to chant the whole verse with her or just half of it. Sanskrit is a beautifully rhythmic language, not an accented language like English. Swami Nirmalananda chanted with a Brahmin priest many years ago to fine tune her pronunciation and is now giving pronunciation lessons online to help us with our learning process. For each verse, there is the word-by-word repetition, then a slow chant to practice the melody and pronunciation, followed by five or six repetitions of the same verse at the usual pace. Click here to access our online pronunciation lessons. We plan to record the multiple repetitions of each of the verses, so you can practice the Guru Gita while you are cooking, doing dishes or maybe even driving. Yet the word-by-word pronunciation and slow chanting is best learned with a chanting book in hand, so these parts of the lessons will not be podcast. The book and the online pronunciation lesson allow you to link up the words on the page, the placement of your tongue, the use of your breath and your voice. You may order your own chanting book, The Nectar of Chanting, from the SYDA Foundation's online bookstore. By July or August, the Ashram’s own CD of Shree Guru Gita will be available. It is being recorded with accurate rhythm and pronunciation. The melody is the one that Baba gave, yet unique because Swamiji added a few notes to help those who are new to the chant find the pronunciation more easily. Many wonderful CD versions of Shree Guru Gita are available; our Ashram version will be at a faster pace than other arrangements, as Baba described so that you practice pranayama by chanting each verse in one breath. Or you can take a quick breath between the first and second lines if you need it. Because of the pace, the full text is completed in 30 minutes.